We constantly strive to enhance our team with highly qualified personnel. Job opportunities are published on our website when they become available. In addition, CPG provides posts for the mandatory legal clerkship (Rechtsreferendariat) as well as internship positions. 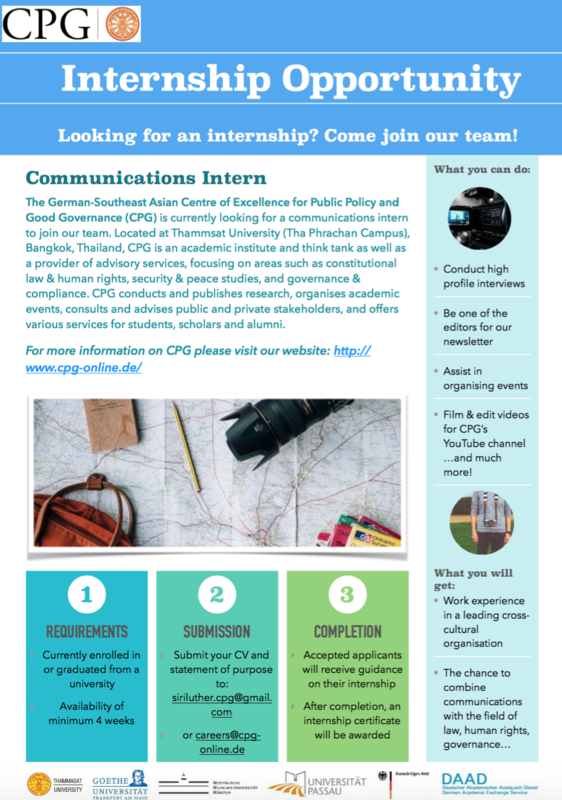 Please send your inquiries to careers@cpg-online.de (Khun Venus). Legal clerks are trained by a German-licensed attorney at law. 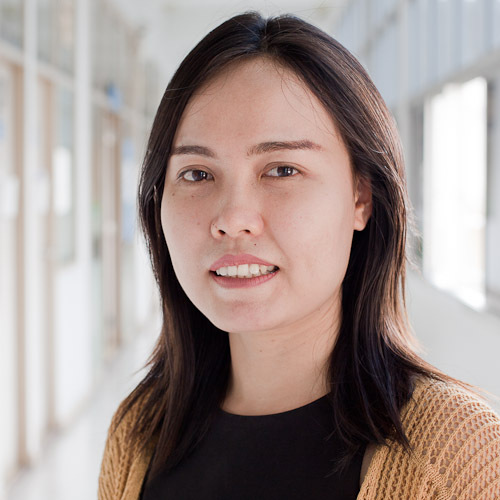 They assist in conducting academic research in the fields of constitutional and administrative law, human rights, compliance, anti-corruption, geopolitics, and regional/Southeast Asian studies. They help organize events as well as prepare publications and presentations. Interns support the CPG team according to their individual abilities and interests. They may assist in organizing events, and taking photos/videos and writing event reports. They conduct research with guidance from CPG staff, and help with the design and layout for promotional material and online publications. CPG welcomes applicants who are highly motivated to work in an international atmosphere. Applicants must have a very good command of English. Additional language skills (Thai, German, other languages) are a positive asset. Applicants must have good computer skills (Word, PowerPoint, social media, photo/video software). Applicants for legal clerkships must have passed the first state exam with an above-average result and show an interest in public law. Applicants for internships should be, at least, in their second year of university studies and have a background in legal, political, or social sciences. CPG recruits legal clerks for a period of three months. Internships may take between four weeks to six months. The CPG office hours are from Monday to Friday, from 9:00 to 18:00, with a one-hour lunch break. Individual arrangements for holidays and days off are possible, subject to CPG’s schedule and workload. Legal clerkships and internships are non-remunerated. The applicant has to ensure that he or she has sufficient funds and support for travel, accommodation and daily living expenses. CPG offers a unique and enriching working environment at the interface between academic institution and regional think tank. We provide assistance regarding visas and accommodation close to the university. Moreover, our friendly staff can give practical advice and assistance in various matters, such as transportation, food, and Thai culture. We usually have more than one legal clerk/intern at a time, which is great for sharing experiences on living in Bangkok. We are located at the Faculty of Law, Thammasat University, in Bangkok. The campus provides possibilities for recreational activities such as fitness and running. The university is located in Phra Nakhorn in the most prestigious part of Bangkok, adjacent to Sanam Luang and the Grand Palace. The offices of the Supreme Court of Thailand as well as of the Council of State are in the immediate neighborhood. Vibrant streets and small alleys with restaurants, street food and bars are in walking distance.